This article is about the Chinese dish. For the similar Chinese-American dish, see Egg roll. Spring rolls are a large variety of filled, rolled appetizers or dim sum found in East Asian and Southeast Asian cuisine. The name is a literal translation of the Chinese chūn juǎn (春卷 'spring roll'). The kind of wrapper, fillings, and cooking technique used, as well as the name, vary considerably within this large area, depending on the region's culture. Spring rolls of different shapes, sizes and fillings have been a popular snack in Asia for centuries. It is believed that spring rolls originated from China. It was a seasonal food consumed during the spring, started as a pancake filled with the new season's spring vegetables, a welcome change from the preserved foods of the long winter months. In Chinese cuisine, spring rolls are savoury rolls with cabbage and other vegetable fillings inside a wrapped cylinder shaped thin pastry. From areas such as Zhejiang in eastern China, and northern China. They are usually eaten during the Spring Festival in mainland China, hence the name. Meat varieties, particularly pork are also popular. Fried spring rolls are generally small and crisp. They can be sweet or savory; the latter are typically prepared with vegetables. This version is fully wrapped before being pan-fried or deep-fried. Non-fried spring rolls are typically bigger and more savory. In contrast, non-fried spring rolls typically fill the wrapping with pre-cooked ingredients. Traditionally, non-fried spring rolls are a festive food eaten during the Cold Food Day festival and the Tomb Sweeping Day festival in spring to remember and pay respect to ancestors. The Hakka population sometimes also eat spring rolls on the 3rd day of the 3rd month of the lunar calendar (三月三 sān yuè sān). The wrappings can be a flour based mix or batter. Hot and spicy popiah in Malaysia. 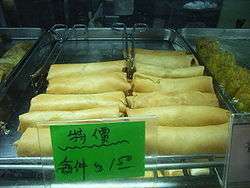 In Taiwan, Singapore, Malaysia and Thailand, the spring rolls come in a number of varieties and often called as popiah. 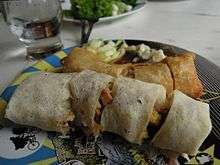 Popiah is popular food in many countries. In northern Taiwan, the ingredients are generally flavored with herbs, stir-fried and sometimes topped with a finely ground peanut powder before being wrapped. The northern-Taiwanese style spring roll is usually lightly topped with or accompanied by a soy sauce. In southern Taiwan, the ingredients are generally boiled or blanched in plain water. Sometimes caster or superfine sugar is added along with the peanut powder before all the ingredients are wrapped. The most commonly eaten style of non-fried Taiwanese spring rolls is called rùn bǐng (潤餅) in Mandarin (or po̍h-piáⁿ (薄餅) in Taiwanese). The fried version with minced pork is called egg rolls or chả giò (southern Vietnam), nem cuốn, chả cuốn or Nem rán (northern Vietnam). Central Vietnam has its own version of a "fried roll" called "Ram." "Ram" is always made from whole shell-on shrimp or chopped deshelled shrimps and some green onion, wrapped in rice paper and deep fried. "Ram", like most specialty food items from central Vietnam, are not widely available in Vietnamese restaurant overseas. A Vietnamese egg roll is different from a Chinese spring roll in that it is typically smaller and contains ground or chopped meats/seafood such as pork, crab, shrimp, chicken, taro or cassava, glass noodle, wood-ear fungi or oyster mushrooms and shredded carrots. Rice papers are always used as the wrappers in Vietnam. A few Vietnamese restaurants in western countries may use the Chinese spring roll wrappers due to the inavailability of rice papers initially. Spring rolls, are a Vietnamese delicacy known as gỏi cuốn. Depending on region, salad rolls were made differently. Some vegetarian families make vegetarian spring rolls rather than meat spring rolls. However, the typical ingredients include slivers of cooked pork (most often cha pork sausages), shrimp, sometimes chicken or tofu, fresh herbs like basil and cilantro, lettuce, cucumbers, sometimes fresh garlic, chives, rice vermicelli, all wrapped in moistened rice paper. A typical gỏi cuốn may contain boiled pork, boiled rice noodle, cucumber, carrot and herb only. Fresh Vietnamese spring rolls can be made at home or found at Vietnamese restaurants and some grocery stores. They are served at room temperature with dipping sauce. Nước chấm, tương xào or a hoisin peanut sauce are all common dipping sauces. A typical hoisin dipping sauce includes chili, hoisin sauce, peanut butter and sugar. A standard nước mắm pha (nước chấm) dipping sauce is composed of fish sauce, lime, garlic, sugar, and chilies or simply fish sauce, sugar and vinegar. In South Korea, a spring roll is known as chungwon (춘권). They are not as popular as other fried foods, but are occasionally found at bars, street stalls, or as a banchan (side dish) at restaurants. In Japan call name harumaki (春巻き). Lumpia is the name for spring rolls in Indonesia and the Philippines, which was derived from Southern Chinese spring rolls. The name lumpia derives from Hokkien lunpia (Chinese: 潤餅; pinyin: rùnbǐng; Pe̍h-ōe-jī: jūn-piáⁿ, lūn-piáⁿ). It is a savoury snack made of thin crepe pastry skin enveloping a mixture of savoury fillings, consists of chopped vegetables; carrots, cabbages, green beans, bamboo shoots and leeks, or sometimes also minced meat; chicken, shrimp, pork or beef. It is often served as an appetizer or snack, and might be served deep fried or fresh (unfried). In Australia, a diverse range of authentic Asian cuisine is available due to immigration, multiculturalism, and the abundant fresh local produce. Both dim sims and Chiko Rolls were inspired by Chinese spring rolls. Australians also have their own version of a spring roll that can be found in many fish and chip shops in Australia and also bought from a supermarket (Chiko Roll). Rather than using pastry with a rolling technique they have a more doughy texture. The German name is Frühlingsrolle and the French call them Rouleau de printemps. While in Poland, they are known as sajgonki, named after Saigon, the city from which many of the Vietnamese immigrants in Poland originated. In the Netherlands and Belgium, spring rolls are known as loempia, and are deep-fried or sometimes baked. They are thought to have been introduced by immigrants from Indonesia. Loempias are filled with bean sprouts, chopped omelette, and sliced chicken or crab. In Scandinavia, they are known as vårrullar/er,  and Forårsruller , or kevätkääryle. In Costa Rica, spring rolls are called in Spanish Rollito de primavera (Little Spring Roll), but is popular known as " Taco Chino" and is offered in almost all the Chinese restaurants as an entree or appetizer. 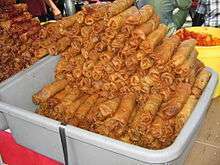 In Mexico, spring rolls are called Rollos Primavera, and are sold in many Chinese restaurants and fast food establishment accompanied with sweet and sour or soy sauces. In the northwest border with the US, specially in Mexicali, Baja California, the spring rolls are known as chunkun, this name could be related to the Korean chungwon (춘권), they are deep-fried and they are usually served with ketchup topped with a dot of hot mustard as dipping sauce. In Uruguay, spring rolls are called Arrollados Primavera, and supermarkets and Chinese restaurants sell them. They are common treat carried by catering services and usually served with a small bowl of hot soy sauce to dip them in. In Argentina, spring rolls are called Empanaditas Chinas, and supermarkets and Chinese restaurants sell them. In Brazil, spring rolls are called either rolinhos-primavera (IPA: [ʁoˈlĩɲus pɾimɐˈvɛɾɐ]), which is an approximate free translation from English, or as it is called in Japanese restaurants and among people which are used to the plate by the way it came to Brazil from Japanese immigrants, "spring roll" (春巻き, harumaki) (IPA: [haɽu͍maki]). They can be found mostly in Chinese restaurants, usually served with a molho agridoce (sweet and sour sauce) to dip, usually bright red and hot, made with ketchup, vinegar, sugar and sometimes spices such as star anise, which accompanies some other kinds of dishes, and can include onion and sweet pepper. Some Japanese restaurants also serve spring rolls in Brazil, but generally plain or with soy sauce to dip (molho agridoce is uncommon but also available in some). They are also found in buffet-like fast food restaurants, and can be called either by the Japanese or Brazilian Portuguese name, but most often the latter. In Venezuela, spring rolls are called Lumpia as in the Philippines and Indonesia. All Chinese restaurants sell them and are usually served with sweet and sour or soy sauce. ↑ Sri Owen (2014). Sri Owen's Indonesian Food. Pavilion Books. ISBN 9781909815476. Retrieved 16 February 2016. ↑ yeinjee (23 January 2008). "Maxim's Chinese Restaurant, Hong Kong International Airport". yeinjee.com. Retrieved 13 August 2012. ↑ Clements, Miles (7 October 2010). "The Find: Dat Thanh in Westminster". Los Angeles Times. ↑ Jacobson, Max (25 September 1997). "A Real Meal for Under $4? It's True". Los Angeles Times. ↑ Tony Tan. "Indonesian spring rolls (Lumpia)". Gourmet Traveller Australia. Retrieved 25 February 2016. ↑ Amy Besa; Romy Dorotan (2014). Memories of Philippine Kitchens. Abrams. ISBN 9781613128084. Wikimedia Commons has media related to Spring roll.